Every object has a history. Unlocking that history is what interpretation is all about and is something we try and do here at PortSide NewYork with our WaterStories project. 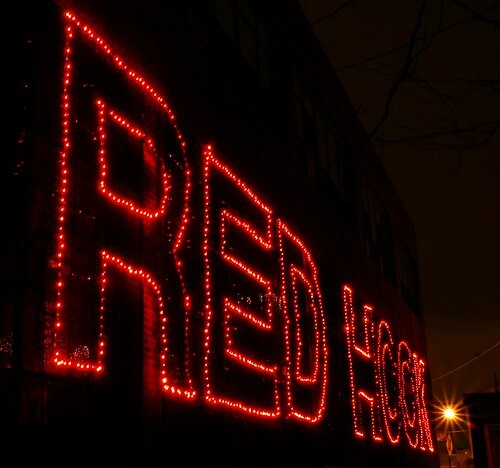 Here’s a story related to the crèche you can see outside the Red Hook Containerport. December 2010, PortSide received an email out of the blue from a Fred DeAngelis. Here are some excerpts. My name is Fred DeAngelis. I am so glad to have found your website. In short I was practically raised on pier 9. My dad worked there with JOHN McGrath for over 20+ years. Of course I would like to volunteer my time to support your project. I have not been on the pier itself since 1986 & would love the opportunity to revisit. Fred and his wife and small child visited the Mary Whalen on 3/12/2011. While leaving, he spotted the battered crèche inside the shed on Pier 9b. He was very moved. He said “my father built that.” He got out of his car to photograph it. The Holiday session on the water front was something literally out of a movie. The surrounding neighborhood wasn't as pretty as it is now becoming and the workers tried to make it as festive as possible. Now remember these were the tough and rugged Longshoreman of yesteryear. However the special feeling of the holidays touched almost everyone. As I remember most of the waterfront would decorate a little. My dad and his friends would cut a damaged container up and make a shed for the decorations that they would put on display. The nativity set was always the center of attraction with a lighted sign that would say "MERRY CHRISTMAS"
Santa was incorporated with strings of lights and the feelings of the holidays approaching would settle in. Food was also another big part of celebrating the holidays. Through out certain parts of the pier they had what they would call shacks. This is a place where till today I have never tasted an Italian meal so good. Joe Black was the cook and also the forklift operator for John McGrath at the time and a special family friend. You could picture snow on the ground, ships all docked at the piers and small shacks that would have smoke coming out of a chimney with friends inside eating and drinking together. Indeed a special time and memories that will last a lifetime. Happy holidays, whatever you celebrate, however you celebrate it. As stories go, this one has more than its share of nostalgia. Going back in history, there was a time when the S.T. Kiddoo was re-christened the Mary A. Whalen. On that occasion, command was given to Captain Alf H. Dyrland. It was 1958. We dissolve to Christmas, 1979. Alf was retired after twenty years as Captain of the Whalen and yours truly, courting his daughter Karen, was a guest for the holiday in the house he built in northeast Connecticut. Of the many ritual observances associated with this holiday, perhaps the most intense, as well as joyous event was the baking of traditional Christmas cookies…Norwegian Krumkake. The recipe was handed down from Alf’s mother. The batter, mixed and chilled overnight, was cooked by Alf on the stovetop using the iron from his mother’s kitchen and rolled into its cone form on a hand turned wooden dowel. You can find recipes for Krumkake on the web and in Scandinavian cookbooks. Alf’s has a wrinkle or two that are special and, in as much as the holiday always was a gathering for an extended family, it produces between ninety and one hundred cones. Alf taught me how to bake and roll, and Karen prepares the batter from her grandmother’s recipe. For a few years after Alf died (1996) I used the old iron. Then an electric Krumkake baker became available and we purchased it at one of the last surviving outposts of Norwegian culture in Brooklyn, “Nordic Delicacies” on 3rd Avenue and 69th St. When Carolina founded PortSide NewYork and rescued the Mary Whalen from the jaws of the scrap heap, she invited the public to visit for Open House New York in 2006. Karen and I arrived and were warmly welcomed by Carolina. The welcome was so warm, we never left and, now Carolina and the Mary Whalen have become part of Alf’s extended family and her ration of Krumkake graces the galley table every Christmas. Note: In 2009, Skudeneshavn only has a population of 3,229. Imagine how small it was when Alf Dyrland left in 1931.